05-06.03.07: Fighting against piracy and counterfeiting, Protecting your industrial property rights within the EU: reasons and ways to protect the rights on your goods and services. TAIEX Seminar, Bucharest Chamber of Commerce and Industry CCIB, Bucharest, Romania. 12-22.04.07: Laboratory of Food Technology, Department of Food and Microbial Technology, Faculty of Agricultural and Applied Biological Sciences, KULeuven, Belgium. 15-30.09.2006: Faculty of Sciences, University Nantes, France. 22 – 28 January 2006: The Interdisciplinary Seminars on the Conduct of Science for Early Career Researchers, Bratislava, Slovakia, organized within the framework of the CEC- WYS European project (www.cec-wys.org), by the French National Institute for Agronomy (INRA) (www.reflexives-lpr.org) and are hosted by the Hungarian Science and Technology Foundation (website at http://www.tetalap.hu). 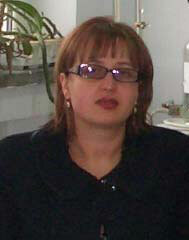 1998-2005: PhD in Food Science, “Dunarea de Jos” University of Galati, Romania. November 2003-November 2004: Marie-Curie fellowship at the Laboratory of Food Technology, Faculty of Agricultural and Applied Biological Sciences, , Department of Food and Microbial Technology, KULeuven, Belgium. January-November (2002) study at Faculty of Sciences, University Nantes, France, with TOPE-AXEST fellowship. January 1998-June 1998: Course organised by Department for Teacher Training, “Dunarea de Jos” University of Galati. January 1997- July1997: accounting degree, Course organised by Ministry of Labour, Direction of Work Protection, Galati. 1997-1998: MSc in Special Technology of Food Industry, Faculty of Food Science and Engineering (BSc), “Dunarea de Jos” University of Galati, Romania. 1992-1997: Engineer in Food Technology, Faculty of Food Science and Engineering (BSc), “Dunarea de Jos” University of Galati, Romania.